The RMT says the five-year pay offer is "unacceptable"
Thousands of Tube workers have voted to strike in two separate disputes over pay deals and proposed job losses. The vote, by members of the Rail, Maritime and Transport (RMT) union, was rerun after London Underground (LU) legally challenged a previous ballot. Workers will begin a 48-hour strike at 1859 BST on 9 June. Transport for London (TfL) said instead of engaging in "meaningful talks" about pay the RMT had submitted "a wildly unrealistic claim". The strike is expected to bring most of the Tube network, used by more than three million passengers a day, to a standstill. 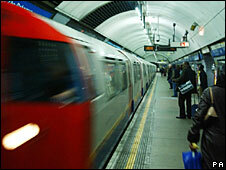 The RMT said the ballot result was "overwhelmingly" in favour of strike action with 2,810 voting for and 488 against. It has accused LU of refusing to abide by an agreement which ensured job security and ruled out compulsory redundancies which would put 3,000 jobs at risk. A five-year pay offer by LU has also been described as "unacceptable" by the union. The RMT's strike is also in opposition to TfL's planned £2.4bn efficiency savings package across the whole network - buses, trams and Docklands Light Railways - which the union warned could lead to compulsory redundancies. RMT general secretary Bob Crow said: "This is a magnificent result which underlines the anger that has been provoked by management in their confrontational approach on pay and job security. "If LU and TfL want to avoid confrontation they should withdraw their plans to slash jobs and guarantee there will be no forced redundancies, start talking seriously about pay and call off the bully managers." TfL said the RMT had demanded an "unrealistic" 5% percent pay rise and was against cutting back office jobs that had been duplicated as a result of maintenance firm Metronet being taken over by LU. A TfL statement said: "The RMT leadership has failed to engage in any meaningful talks on pay, instead submitting a wildly unrealistic claim - demanding a 5% pay rise for fewer hours in the middle of a recession. "Our offer guarantees real wage increases for the next five years. Very few Londoners have that level of certainty for the future. "This review does not impact on front-line staff working on trains, stations or maintenance and there will be no impact on Tube services." LU has offered staff a 1% pay increase in the first year of the five-year deal, with increases of 0.5% in the next four years. 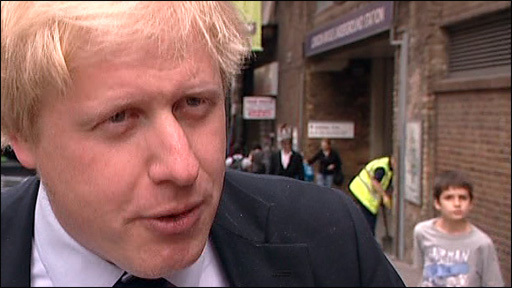 London Mayor Boris Johnson urged the RMT to negotiate with LU to avert a strike. He said a Tube strike would cause "extra cost and aggravation for businesses and commuters" and was "the last thing London needs in a time of real economic hardship". The London Chamber of Commerce and Industry estimated strike action could cost the capital up to £100m in lost productivity. Policy Director Dr Helen Hill said: "This stoppage could not come at a worse time for the London economy, and will deal a body-blow to many already hard-pressed businesses."